Phytoscience proudly presents to you a revolutionary product birth from years of research, developed by a team of scientists from USA and Switzerland. Crystal Cell was tested vigorously for its potency in its purest form to ensure that our formula is complete and balanced. As a result, your skin will be supple and radiant while your body’s health improves continuously. Crystal Cell has two main components that contributes in pigmentation control and skin lightening and they are Phytoene and Phytofluene. They are colourless carotenoid that has an outstanding photo-protection capacity. 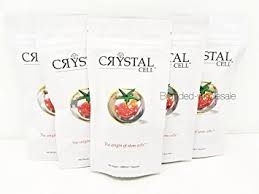 Therefore, consuming Crystal Cell will enable your body in attain a highly proactive protection ability. Both carotenoids will protect your skin from chronological and light-induced aging which extends our skin cell’s vitality and prolong the skin’s youthful appearance. Phytoene and Phytofluene have the ability to absorb light within the UVA and UVB spectrum and this has the effect of blocking harmful free radicals from the UV rays. In the absence of the damaging factors and the presence of free radicals in our body system, the human aging process is delayed tremendously. Phytoene and Phytofluene are also able to exhibit anti-inflammatory properties against wounds, thus speed up wound healing and the restoration of acne scars. It has also been proven that it can increase the protection of DNA strands in skin cells, against damage caused by outside harmful environment. Crystal Cell enables our skin to form new skin tissues, thus speeds up the process of skin renewal. Dr. Fred Zulli, CEO of Mibelle Biochemistry Switzerland.